Does anyone here have artificial grass? We're considering it because our grass always looks crap thanks to Akira digging. I've read that it's completely dog safe and they can't dig through it. Is that true? I'd love to get some experiences from dog owners rather than just the opinion of the people who want to sell it. Quite a few houses in our area have put down fake grass lately. The one negative thing that I have heard is that it gets very hot to touch in Summer so the person that told me this said they didn't think it was suitable for dogs at all. I don't know if all types of artifical grass would be the same in that respect and I've never tried standing on it on a hot day but it did make me wonder. We put down our fake turf last year and I loooooove it!! We have a Golden Retriever (almost one year) and friends often bring their dogs over for a play (GSD and another Goldy majority of time) and it has survived her puppyhood and their playing. Cleaning it is easy, and never had stains for number 1's or 2's. In Summer the only time I noticed it hot was when we had that week of 40-43 but then everything was hot. We also have a market umbrella that we put over Ellas clam pool but otherwise been fine with it. We also got the more premium range so not sure if that makes a difference (was on clearance - bargain!). It also came with like a 10 year fade/tear/etc resistant warranty but its been down for over a year now and no problems or anything with it! Plus people always comment on how lovely our lawn is and its not until they are right in front of it they ask if its real or not. Awesome to know that Jenni87. I think we'll make sure to get one with a good warranty as well and ask them "If our dog manages to dig through it, what happens?" and possibly get their answer in writing. Akira is very good at destroying things so I want to make sure we have all bases covered with this! What kind of drainage is there with fake grass. Just googled it and it look quite nice. I put artificial turf in about two weeks ago and I love it! It cost me $2000 for 26 square metres but is well worth it in my opinion. My yard was a swamp as well as it gets very little sun. We have had heaps of rain this week in Canberra and it has drained perfectly. They put crushed granite under it so it drains well. I have a Rotty, a Lab and a Great Dane foster and they have all had a great time playing on it. So far, no problems at all. There are a few threads on this. I know one other DOL'ers dogs ate the entire lawn so I suppose it depends how keen your dogs are to dig stuff up. I don't know how they would get the edges up as they are glued and pinned. I put a middle of the range fake grass in my backyard, and my dogs managed to pull it to pieces. They scratched at the sides and then pulled it up and chewed it. When it rains the water just sits on top of the grass in big puddles. I also found that after a while it started to smell like pee. Did you have it professionally laid PeiPei? From the threads that I have read that seems to be the difference. The stuff you buy at Bunnings seems to be a different product. I have had fake lawn for about 4 years now. Its the best thing I ever did to my back yard but yes it was expensive. Having seen the work that went into it and the gadgets they used to do it I would not attempt it myself. Mine has developed a few small dents in the high traffic areas so I would recommend you get the putting green version of the ground prep rather than the lawn version (which i have) as that means double the depth of crushed granite and sand and rubber layers. I have 8 dogs who all pee and poop on it and it cleans up very easily. There used to be two more bigger dogs as well, a Dane and a ridgeback X so lots of poop and pee. It is a whole lot of layers of ground prep and then underlay and then the grass which is all glued together and pinned down every 10cm all the way round. After all that they pound a mix of sand and rubber granules into the pile of the grass. This makes the grass sit up like grass, not flat down like carpet and it makes it softer underfoot. The ground prep drains very well and the grass itself is on a base that is perforated all over so water does not ever pool on it. It does feel a little warm to me barefoot on 40' plus days but my dogs all just lie out on it and bake in the sun, they love the heat. You are supposed to keep the organic matter off it (leaves etc) but mine always is just about buried before I sweep it off and no issues so far. The occasional squirt with a hose is all that is needed. You might get a bit of a pee smell in really hot weather but I just squirted some water around with biozet in it. Frankly a real grass yard would probably also smell of pee in the same situation. At least I can actually put biozet onto mine and not kill it. It was well worth the expense and I would recommend it but only if you get it professionally laid with all the special layers of ground prep and sand/rubber etc. i agree with all tj says, mine had the same prep, it has developed a few dips, its a high traffic area. it does get hot in summer, and i spray it with vinegar if it gets smelly. I've googled about this stuff before. Some of the USA hits talk about the grass potentially giving off toxic fumes. I know someone with artificial grass who has lost two dogs to IMHA. I'd be wanting to find out a lot more about it before I laid any in my yard. I now a breeder who also had it laid & had 2 litters with massive health issues . I use artificial turf in my snake enclosures which are under multiple heat lamps and have never found it gets hot. I do recommend spending the $$$ on a good quality turf though, as the 'cheap' stuff tends to break apart around the edges and you'll end up with thousands of tiny green bits all over the place. Probably wouldn't matter so much outside, but it drives me nuts! There was a brochure from Clark Rubber (Brisbane) in our mail-box & I kept the page that listed artificial grass. There was a wide price range from $29.95 up to $99.95 per metre. Only the $99.95 one specifically says 'Child & pet friendly'. 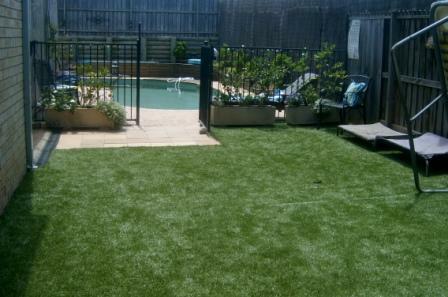 Meadow Landscape Synthetic Grass $99.95 per metre (the one that says 'child & pet friendly'). This is also the only one with a note saying 'Price doesn't include the sand and rubber fill required to complete an installation. I'm a bit leery about it too and toxins :D I'd rather steer clear of it no matter how good it looks. We are in the process of getting Termiturf laid in our back yard - quite pricey but top of the range - they have prepped the yard so far and even with just THAT done it looks better than the swamp it was before. Will post pics when it is all done - which should be tomorrow - YAY!! ⌂ Well for starters, no more prickles and grass seeds to groom out of their coat. As for any mess, firstly clean up any excess as you would a traditional lawn area and then simply spray the soiled area with a hose and brush the area as necessary. As man’s best friend likes to dig, all joints are sealed and the structure plus the uniformity of your new termiturf lawn should discourage this. The quality designed backing has accurately measured perforations which allow for drainage, this obviously helps eliminate any nasty odours and yellowing you would get with a seeded or instant lawn.